Citronella oil is extracted from fresh or partially dried leaves of citronella grass, Cymbopogan Nardus and Cymbopogan Winterianus. 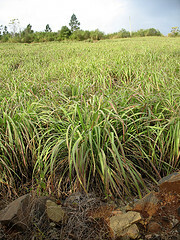 Citronella grass is native to India and tropical Asia. It's a tall perennial green grass with red base stems. Oil is extracted, by steam distillation, producing Ceylon or Java type oil. It has a pale yellowish-brown color with a thin consistency. It's a strong, sweet, lemon citrus fragrance with some underlying woody tones. It's used in commercial and homemade products: soaps, shampoos, candles, deodorants, lotions, gels, perfumes, insect sprays, towelette wipes and household disinfectants. Citronella can sanitize surfaces and leave a fresh scent when mixed with vinegar. Place citronella candles outside to repel flying, biting, insects. Citronella is found in soaps, sprays and massage oils for pets. The application will last a few days to a week. It helps rid dogs of fleas or ticks. Keep your pet clean and free from pesky biting insects. Just make sure the citronella soap, spray or massage oil does not irritate your pet's skin or cause any reactions. CAUTION! Certain dogs are susceptible to seizures when exposed to essential oils. Small dogs should be watched, more carefully, for any signs of reactions. CAUTION! Cats should never be exposed to ANY type of essential oils, including citronella, due to their thin skin. Essential oils can be fatal for cats. SAFETY WITH CITRONELLA - CAUTIONS! Citronella oil is powerful. It may cause skin irritation or contact dermatitis in some individuals, especially those with sensitive skin. If this oil is used as directed on the product label it is not expected to pose health risks on people or around the house. Avoid Citronella oil if you have heart problems, since it can increase the heartbeat. Avoid using any essential oils when pregnant. Do not use on small children. Do not use on pets with thin or sensitive skin. Essential oils contain bioactive ingredients. They contain natural chemicals that interact with biological systems. They're potent chemicals and should be used with care. Never use large amounts of any essential oils externally, or internally. Never use them straight. They must always be diluted in carrier oil, or soap, lotion, or other buffering agent. Finally, never use them without knowing what their bioactive compounds are known to do. Learn how to make soap using the melt and pour method. Mix all ingredients by stirring vigorously. Pour into prepared soap making molds or hand mold into various sized balls. Depending on how much extra oil you add, it usually takes a couple of hours for soap to set up. Use after soap hardens. Congratulations! You've made citronella goat milk soap! Citronella goat milk soaps are great for the outdoor adventurer. A homemade goat milk soap, made with citronella oil, is beneficial when working outside, or on a camping trip when surrounded by woody areas. Goat milk is, naturally, moisturizing. It has vitamins A, B, C, D, E and K. It's nourishing, softening and soothing, even for sensitive skin. It helps maintain the natural pH level of skin. The combination of goat milk with citronella, eucalyptus or other repelling oils makes it useful for hot, buggy, Spring and Summer months. Avoid harsh soaps that irritate skin with "manufactured" ingredients. Diluted citronella oil blends well with carrier oils: Grape Seed, Olive or Jojoba. Blends well with essential oils: Bergamot, Bitter Orange, Cedarwood, Geranium, Lemon, Lavender or Pine. Still looking for the right specialty or soap making oil? Find it, now!